Ha ha, BuzzardFeed, get it, because they, uh, eat rotting flesh? The fact that there are both American and British versions of The Office makes for a fascinating comparison on how the two cultures have diverged. One difference that I think is underrated is inherent to the very different ways the TV business operates on opposite sides of the pond. The British Office, like most British shows, consists of two six-episode series, plus a couple of Christmas specials. The American version, in contrast, put out 200 episodes over nine years. And there’s just some things you can’t do if you expect people to keep watching that much TV. A lot has been written about how David Brent is so much more insufferable than Michael Scott, and how that proves British TV is meaner or more uncompromising or whatever, but I think mostly it’s just that someone that obnoxious is just barely sustainable over about 8 hours of screen time and not much longer. The more time your audience has to spend with a character, the more they eventually have to like them, or at least have some empathy for them. Some variation on this is true in comic strips as well. 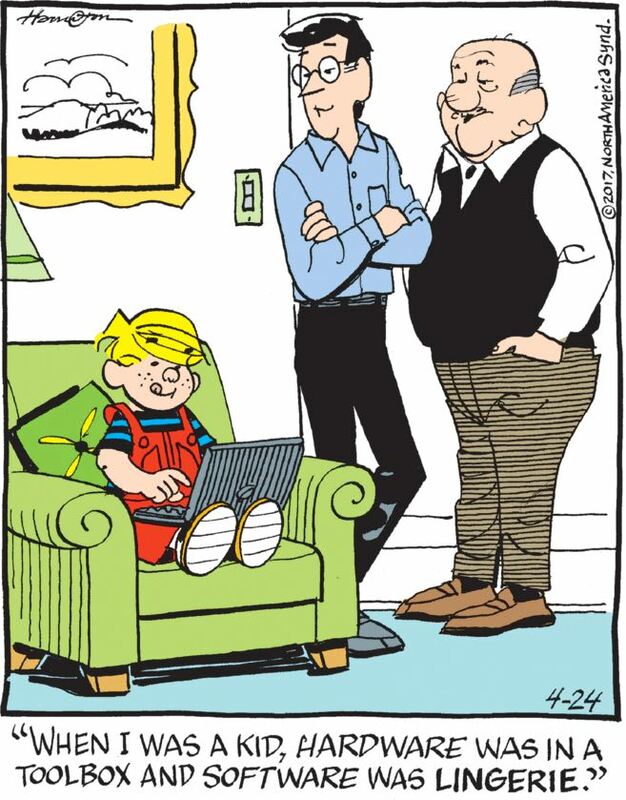 Obviously their characters don’t have to be likable, because if they did Les Moore wouldn’t still be the protagonist in one of the most widely syndicated comic strips in the country. But they do eventually assimilate into the general milieu of the strip, even if they were originally introduced as a foil to the other characters. Take Mason Jarr, for instance: when we first met him, he was an idiot washed-up actor, but then he got involved with one of the strip’s main characters and signed onto a movie about a classic comic book hero, which means that he’s actually good now, so he’s ranting and raving about how a big-budget sci-fi action movie is art and shouldn’t be sullied by fans speculating that it might be recognized by the industry as one of the best movies of the year. This is definitely a thing that nobody in real life would do and yet also definitely a thing that the “sympathetic” characters in the Funkyverse would do because life is suffering and we certainly wouldn’t that suffering briefly alleviated by, say, winning an award. I’m going to go on the record as saying I’ve always liked Dolly’s little hat, with its cute ear puffs. It’s a nice period touch from the days of this strip’s origin and also would 100% be something a hipster parent would put on a child and/or wear themself today. Its presence does imply that it’s still winter, or at least winter-ish, wherever the Keanes are. Are snails out and about in cold weather? 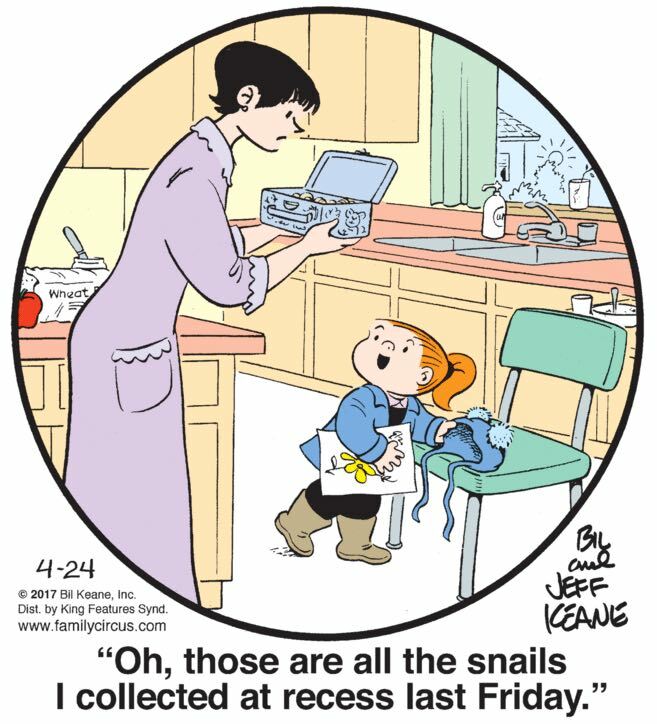 I actually find them kinda gross, so I’m reluctant to do research to find out, which is also why I’m talking around the fact that the joke of this strip is that Ma Keane is staring at about 7,000 cm³ of tightly packed dead snail. God, the smell. Think of the smell!